Everyone talks about the Japanese interpretation of a British roadster being the Miata… copied the Lotus Elan, all the fun and drips less oil, blah blah blah. But back in 1963 when Tom Matano was only a teenager and the Miata wasn’t even a glint in his eye, Datsun released a roadster to compete with the British, Italians, and the odd German or French. And the Datsun SPL3xx roadsters, built from 1963 to 1970, were really pretty competent cars, even if they weren’t widely recognized as such when they were in production. Overshadowed by hits like the 510 and the 240Z, it’s only in the last few years they’ve come out of the shadows of their more famous siblings. 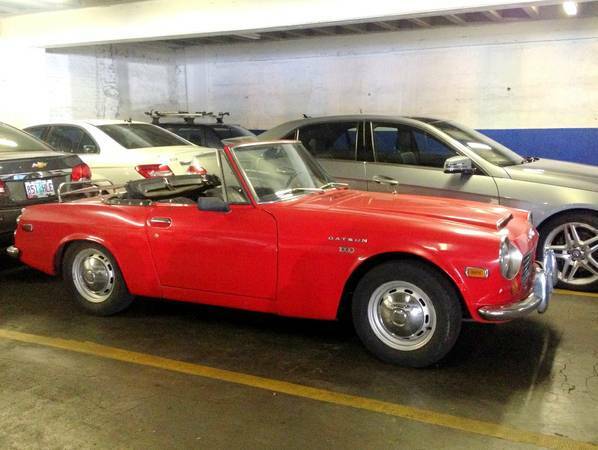 Check out this 1970 Datsun 1600 SPL311 Roadster for sale for $3900 in Portland, OR. In summer, the classic car market blossoms and people are reminded, either by new acquisitions or just the good weather, that they really should get around to selling that old thing in the driveway. Of course, sunny weather is also a good time to sell a roadster since it’s the time when you want to drive with the top down, although with near-100-degree temperatures in western Oregon right now, that may be a stretch, and your modern car with air conditioning and cloth seats doesn’t look so bad. Either way, it does keep the cars dry, and perhaps you’ll want to wait out the hot temperatures by fixing up the interior of today’s feature. 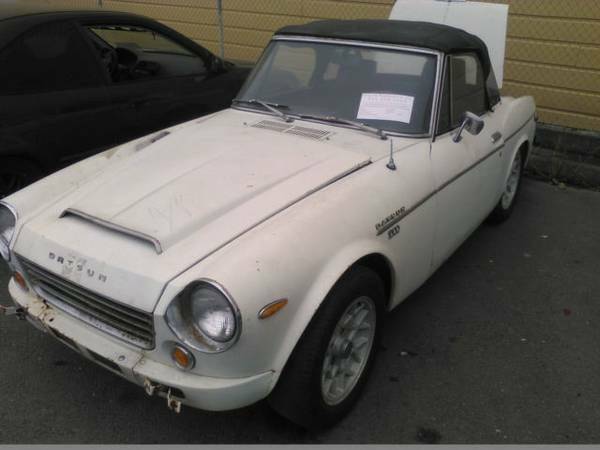 Check out this 1969 Datsun 1600 Roadster for sale for $3000 in Medford, OR. Update, 5/7/14: Three months later, it looks like someone picked this up, took it down to Southern California, and a quick respray and reupholstering job later, along with new brakes, carpeting, alternator, tune-up and carb, it’s up for auction with an opening bid at an eye-watering $11,000. Wish him luck realizing what would be a strong profit if someone bites on this one! Original post, 1/29/14: Would you believe the BMW Neue Klasse had its 50th anniversary back in 2012? That’s right, five zero. And the improved version of the original 1500, the 1600, is celebrating its 50th anniversary this year. And yet for a 50-year-old car, they remain quite driveable in modern traffic, because all the things that made them great when they were new, like good brakes and handling, and decent power, still make them competent drivers by today’s standards. Perhaps that’s a bit of a stretch for the earlier Neue Klasse cars – the 1600 sedan, for example, had 83hp and 83 lb.-ft. of torque pulling along its 2315 lb. for a top speed of 93mph. 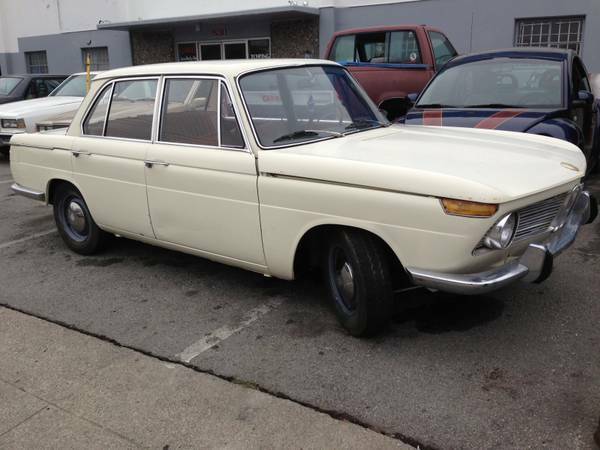 So you’ll need to flog it a bit – check out this 1966 BMW 1600 Neue Klasse for sale in Redwood City, CA for $2950.